With bare trees and snow on the ground it doesn't make sense to wear your favorite summer dress and heels to your winter engagement session, but that doesn't mean you have to dress like the little brother from A Christmas Story either. Fleece lined leggings, vests, flannel, sweaters, and pea coats all help you stay warm while also adding a bit of fashion and variety to your outfit choices. Go crazy with hats, mittens, scarves, and anything else you can find! Sometimes simply adding or subtracting an accessory can create an entirely different image. Plus, it's a quick change and doesn't involve you taking off your jacket! Taking your mind off the cold is easy when you're DOING something. 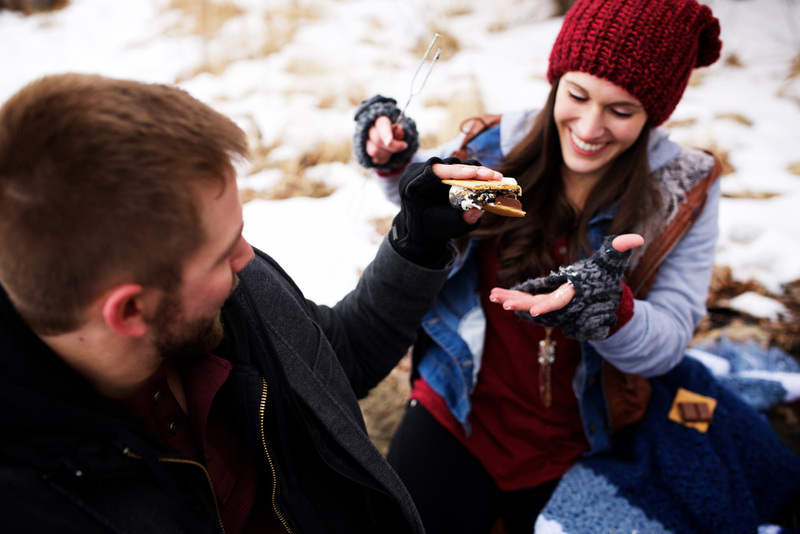 Sledding, snowball fights, ice skating, winter bonfires (don't forget the s'mores)! Go big or don't go at all! -If your photographer allows, schedule 2 different appointments within the same week. When the weather is posted for the week choose the day with the better forecast and cancel the other. -Bring something warm to drink and tuck hand warmers into your pockets. -To avoid having the cold air give you a red nose in your photos, spend 10-15 minutes shooting outside then run back to your car to warm up. Repeat. -Chapstick and Kleenex sure come in handy. -Be prepared to adapt to the conditions. There may be times you have to sit in the snow and there may be times when a spontaneous snowball fight begins. Go with it! -Bringing small, white washcloths to sit on in the snow can save you some serious booty frostbite. Tuck it underneath, and you can't even see it! -When all else fails, have a luau. Check out these other wintery posts!